Great news theatre goers. The magnificent family-friendly live show STOMP crash-bangs into Melbourne again this May and tickets are now on sale. STOMP last performed to Melbourne audiences in sell-out shows back in 2013. Get your credit card at the ready because this is your chance to see STOMP again (or for the very first time) at The Comedy Theatre from 1 - 6 May 2018. STOMP returns to Australia with its incredible energy and hypnotising beats after successfully touring the globe many times. Over 26 years, STOMP has performed to over 12 million people in 55 countries across six continents. STOMP; One of the most energetic live shows you will ever see! This phenomenal music extravaganza performs without spoken words nor song. A musical without being a musical! 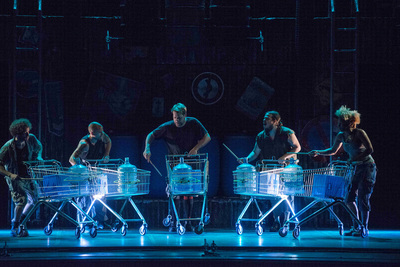 The entire show features an ensemble of talent who craft musical rhythms using everything from Zippo lighters, bin lids, supermarket trolleys and even the kitchen sink! Eight performers use an array of ordinarily mundane objects, from which they create musical magic; an exhilarating soundtrack inspired by the commotion of everyday life. STOMP is performed on a 'junk yard' style stage set and there are dancers, but not your typical flashy-clothed theatrical kind. Expect a cast dressed in paint splattered street attire; singlets, cargo pants and big stomping boots. See STOMP’s signature high-octane mix of slick choreography, tight ensemble work, industrial percussion, and continuous comedy; as the irrepressible troupe turn brooms into soft shoe partners, clapping into intricate conversations and water cooler bottles into sophisticated instruments. STOMP is one of the most energetic shows you will see live on stage. Make sure you don't miss it. Book: www.StompTour.com.au or call Ticketmaster 1300 889 278.